Introducing the MAKING UX WORK Podcast! Hey friends! I wanted to let you know that Ive just launched the inaugural episode of my new podcast, MAKING UX WORK  and you can listen to it right here. Its a little different than most of whats out there, because my guests arent the rock stars of UX, Design and Tech. I think those of us with high profiles get more than our share of airtime already. Are UX Interview “Exercises” Crossing the Line? I’m increasingly troubled by stories from young Designers and UXers about UX interview “exercises” potential employers are asking them to do. Specifically, I’m seeing too many instances where, to my eyes, it looks like these organizations are asking interviewees to do real project work — for free. Today’s fast food for thought re: #design and #UX. 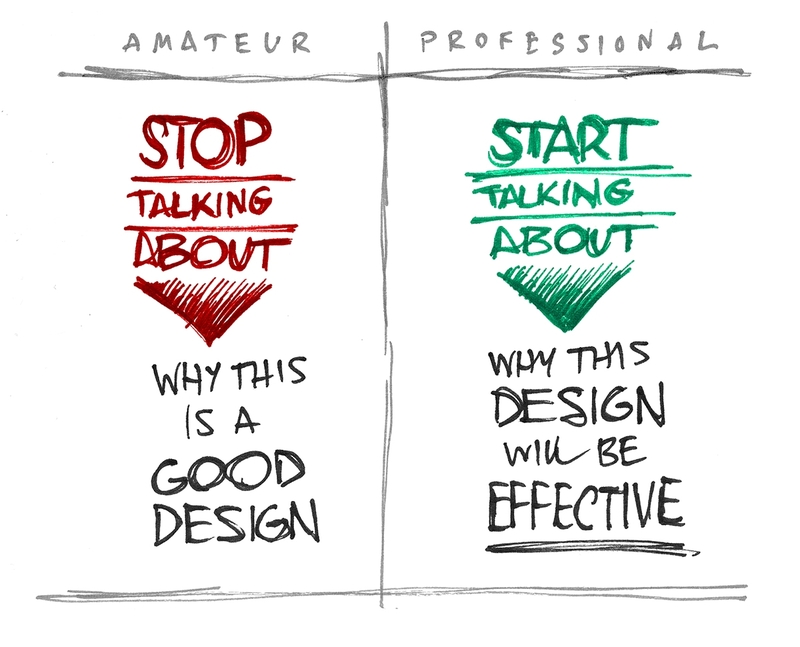 If the conversation is around how good the design is or how it looks, it’s the wrong conversation. The shift depicted here marks the difference between amateur and professional design. “Our users run the gamut from business professionals to scientists and creative types. Most of these folks tell us they feel overwhelmed and distracted during the workday, and that this is one of the biggest barriers to creating work they’re proud of. Want stakeholder buy-in? See UX their way. Most people in management or executive positions can’t truly see what’s broken, because they’re usually only looking at the side that’s working. Truer words were never spoken. I wrote that in my sketchbook on the spot and have never forgotten it. Design is Design is Design is…UX? Look, we all know at this point that UI design is not the same thing as UX, and that doing one well does not guarantee the quality of the other. But at the same time, the two are more closely related — interdependent, in fact — than most “experts” seem to want to admit. The truth is that, with a digital product, you cannot have meaningful UX without equally great UI design. Although we are all — whether UXers, designers or developers — fiercely dedicated to delivering great UX in our daily work, we often fail to apply the same discipline, rigor or effort to our personal websites or portfolios. We’re all on the same side here…aren’t we?